SCARED: an exclamation mark, a red circle with white cross and the word ‘error’. This looks serious. Something is broken. application? do I need to rub lanolin on my computer? runtime? do I need to run somewhere and time it? what does this mean? Why am I being told it? Did it get stuck in the stack overflow? INSTRUCTED: to contact IE7 and, or, MVCRL support teams for more information looks like I should know more. UNINFORMED: how do I contact them, how do I find out how to contact them? 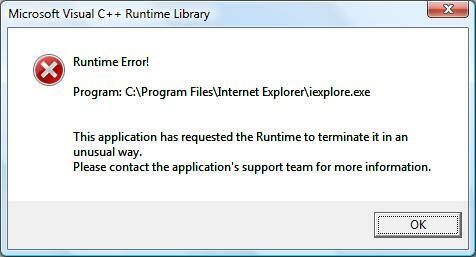 If the Microsoft IE7 team’s program (application?) is going to make unusual requests to the Microsoft VCRL team’s program (application?) it should do it directly without hassling me to learn technical jargon and find out how to contact them then PAY for the pleasure of talking to them because they can’t be bothered to talk to each other before shipping software that produces errors and causes me emotional distress. This scribble was published on Sunday, April 19th, 2009. You can follow any banter on this scribble with the RSS 2.0 feed. You can share your inspired musings after typing the anti spam word near the bottom of the page. But no Pinging because its too naughty. At least after twenty-odd years’ running into them I know they’re only nature’s way of sayng that Microsoft writes untidy coding.